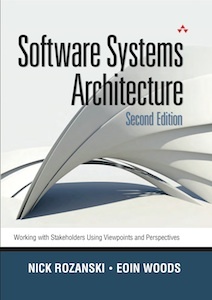 It shows why the role of the architect is central to any successful information systems development project, and, by presenting a set of architectural viewpoints and perspectives, provides specific direction for improving your own and your organization’s approach to software systems architecture. This web site contains a selection of supporting material for the book, including sample chapters, references and white papers. Click on a menu item at the top to find out more about our key concepts of Stakeholders, Viewpoints and Perspectives, and to sample some material from the book. Click on Resources to browse through some other material we have written, jointly or separately, and to read about Wirfs-Brock Associates training which is based on our book. Click on Reviews to read what a number of other people have said about our book. Click here to download a Quick Reference Card or Architecture Description template which you can use to document your own architecture. Nick Rozanski is the functional architect for a front-office IT department in a major British bank. He has oversight of the systems landscape for the whole department and also provides architectural guidance and support for key systems and projects. He has worked in IT since 1980 for several large and small systems integrators, including Logica, Capgemini, and Sybase. Eoin Woods is a lead system architect in the equities technology group of a major European investment bank with architecture and design responsibility for a number of the organization’s key systems. He has been working in software engineering since 1990 and during that time has worked for a number of technology companies, consultancies, and financial services firms.